Video interviews are, in many ways, different from in-person interviews. 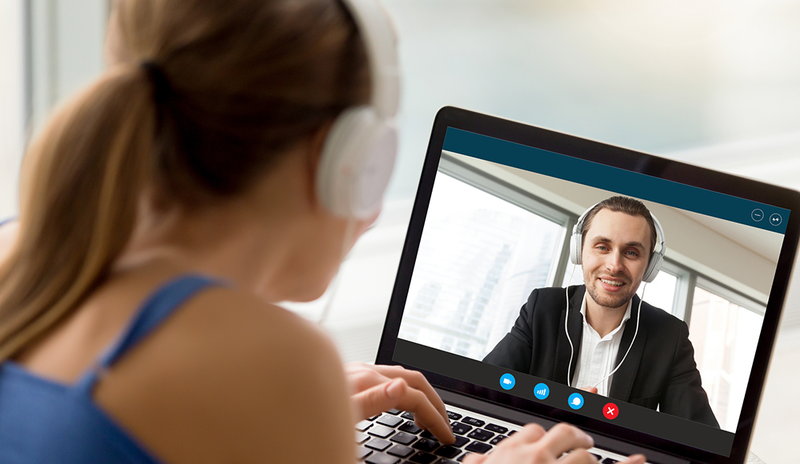 While they may be more convenient for both you and the interviewer, video interviews also pose their own unique challenges. Set up your computer so that you have a blank wall behind you when sitting down. You do not want the interviewers to see a messy work area or your personal items. Be sure to clean your webcam’s lens, too. The clarity and quality of your image matter. You want to set up your lighting in advance. This will take longer than you might think. Try using three-point lighting, with two lights in front of you and one to the side or behind you. Practice moving the lights around to avoid shadows and looking washed out. If you do not have extra lamps, maximize your overhead light and use natural light to your advantage. If you use natural light, be sure to set up at a similar time as the interview. Your perfect 9 a.m. lighting may not cut it for a noon interview! Be cognizant of where your ceiling fan and lights are located and how they will appear on camera. You do not want to look like a kid wearing a propeller hat! The webcam should be at eye level, so if you need to, prop your laptop on a stack of books to elevate it. Also, be mindful of where the camera is pointed – you do not want cleavage showing because the camera is aimed at your chest and not your face! Be sure you are sitting up straight. What constitutes eye level will be different if you are slouching. Practice talking into your microphone. Record a short video, then play it to see how you appear and hear how you sound. Make adjustments as necessary. You should not have to hunch or otherwise contort yourself to get a clear recording from your microphone. Position your laptop – or standalone mic, if applicable – so that it can clearly capture your voice while you sit up straight with your shoulders back. This includes any jewelry or accessories you plan to wear. Do not wear jewelry that makes noise when you move or shift. Again, record a brief video and play it back so you can identify any potential issues, such as jingling earrings or a gap in your shirt buttons. As with any interview, you’ll want to research the company’s core values, mission, products, performance, and other relevant information. Pay attention to the specific language the company uses on its website and in its mission statement, and try to incorporate this language into your interview answers. This will signal to interviewers that you’ve done your research. Determine how you will layout your notes during the interview. Avoid having loose papers in front of you. You do not want the interviewers to hear you shuffle papers while searching for an answer. Tape documents or sticky notes to the side of your screen so you can easily scan them without looking away from the computer. Do a few mock interviews so you can see how you look and behave on camera. Practice answering typical interview questions for the industry/role. A quick online search will provide you with lots of possible questions. Pay attention to your speed and pitch when you evaluate your mock interview. Are you talking too fast or too slow? Do you sound too euphoric or giddy due to nerves? Do you look washed out and ill due to poor lighting? How do your clothes look? Setting up your webcam for a video interview takes time. I recommend you set aside 2-3 hours for this activity. Once you have the perfect set up, take a picture or make a sketch for future reference. Note the date and time of the picture as well. Remember: If you’re using natural lighting, the time of day counts. Check out part two, where I’ll share tips on what to do on the day of your video interview!